PivotCare Elite Fixed Indemnity Benefit Insurance, a limited benefit health coverage plan, is designed to empower members to manage and control their health care costs. It is administered by Allied National and underwritten by the Standard Life and Accident Insurance Company. Affordable plans that offer a variety of benefits at rates that meet any budget. No insurance deductibles or coinsurance limits to meet. Set dollar amounts for doctor office visits, hospital stays, lab work and more. One of the nation's largest provider networks. 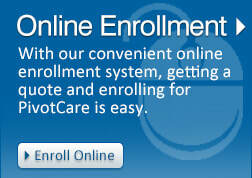 ﻿﻿PivotCare Elite is limited benefit fixed indemnity accident and sickness coverage. Benefits are not meant to cover all medical expenses. Plan benefits vary by state. Would you like a customized web page for your sales? Contact 844-630-7500. We will assist you in getting a PivotCare Elite affiliate link to send to your clients. You will not need to fill out any Standard Life and Accident Insurance Company appointment paperwork until after you submit your first case. PivotCare Elite is underwritten by the Standard Life and Accident Insurance Company and is rated A (Excellent) by the A.M. Best Company. If you do not have a Pivot personalized page, please fill out the information below and submit your request. After submitting, it takes 24 to 48 hours to create your web page. Allied sales will email you with your link as soon as it's ready.